but didn't include the table. 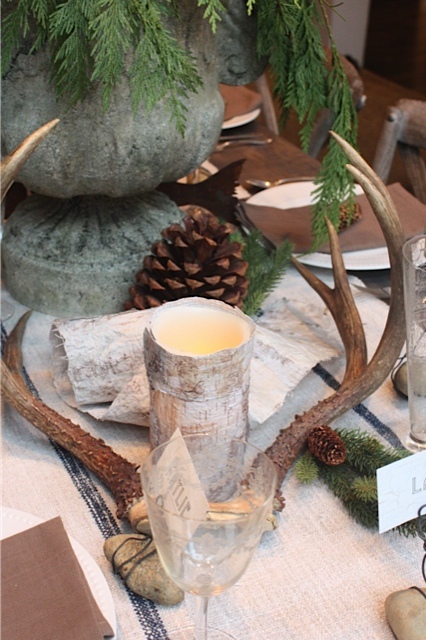 I wanted to go with a rustic look, a nod to where we live, the beautiful Pacific Northwest. We are surrounded by trees and mountains. We live on a lake. 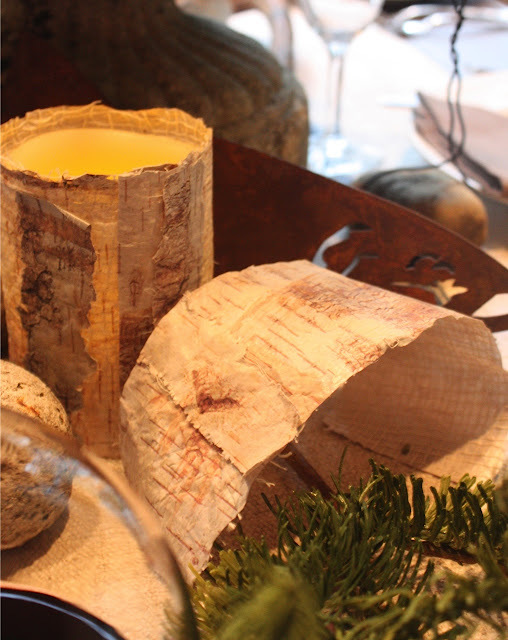 So I wanted to incorporate all of the natural elements you would find right outside the door. The main centerpiece is a big garden urn I got at Home Depot years ago. 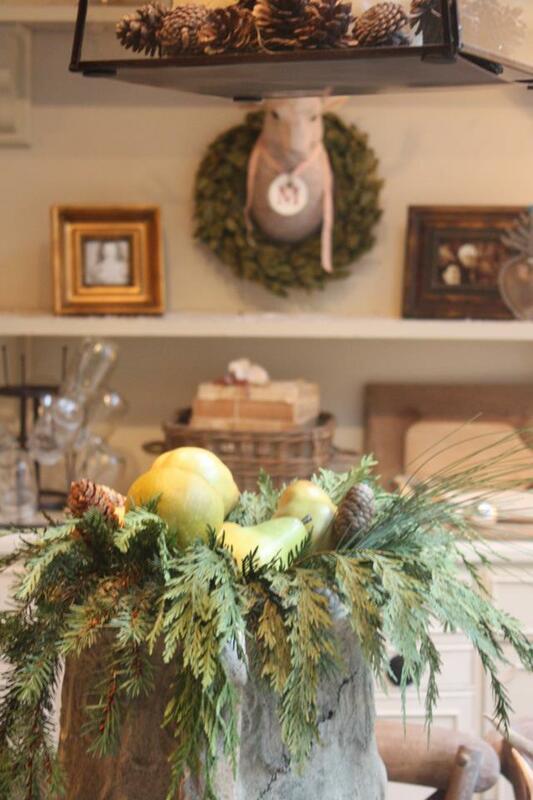 I filled it with cedar branches from the yard, added a few pinecones, and topped it off with some fake pears. I also filled the base of the lantern hanging above with pinecones. 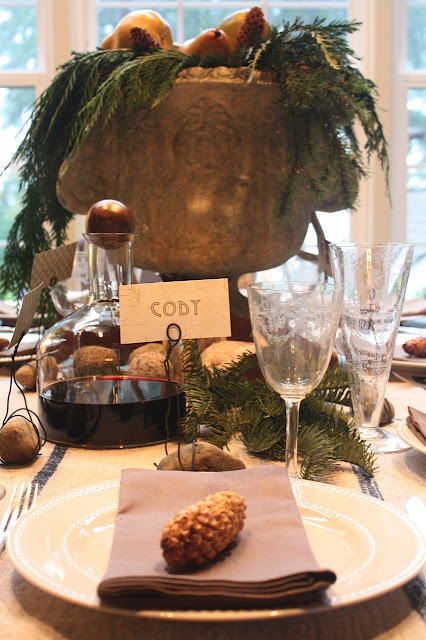 Each place setting has a pinecone on it. These were purchased as I did not want little creepy crawlers on the table. 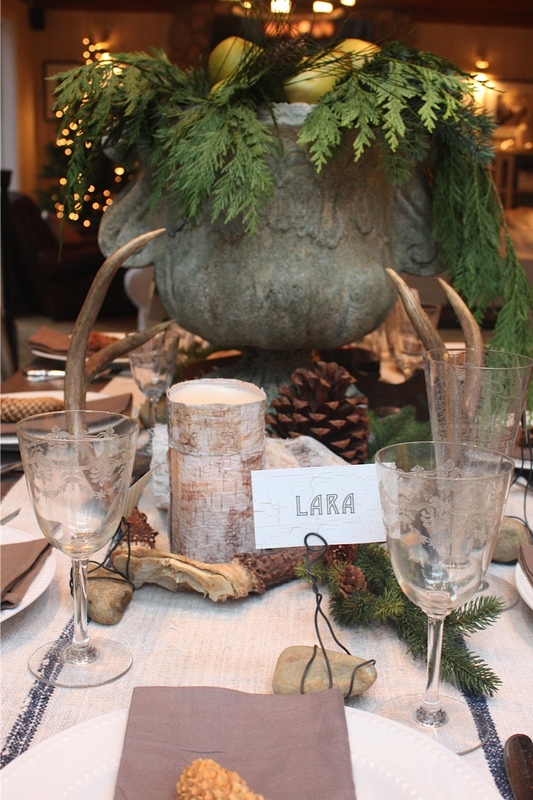 I added a lot of pinecones, rocks believe it or not, antlers and more greenery. Once a year I get out my grandparents French wine and beer glasses. 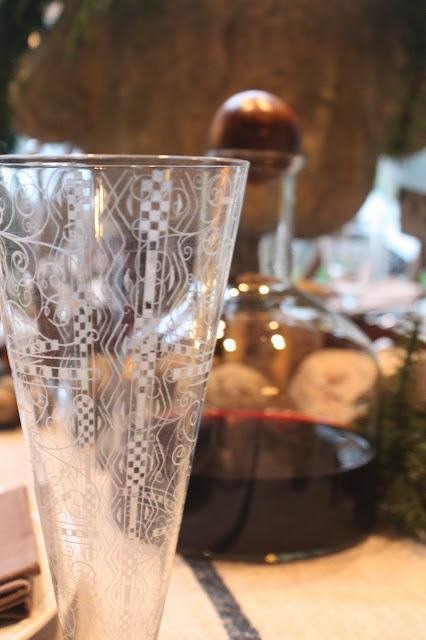 The wine decanter is something new. I got it at World Market and you can find it here. 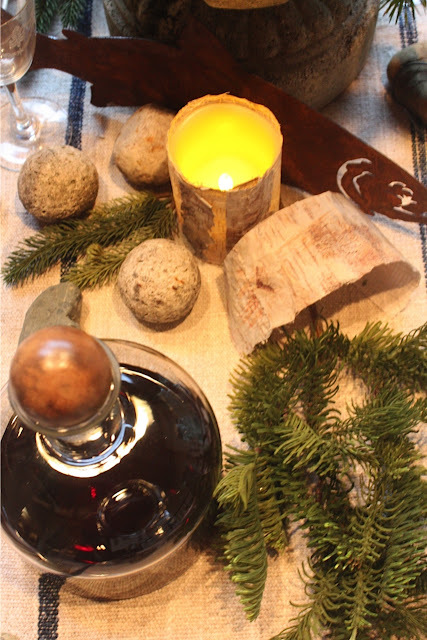 I bought some faux birch bark sheets here, and wrapped them around battery operated candles. I just left the leftover scraps on the table all rolled up. 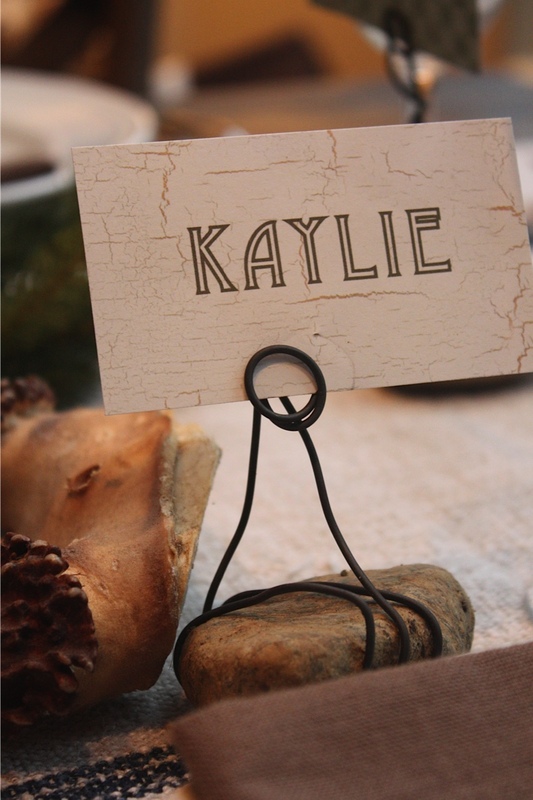 In keeping with the "natural" theme, I made these place card holders out of rocks from the yard and some wire I had on hand. Then I just printed out names on scrapbook paper, and slid them in the wire on top. 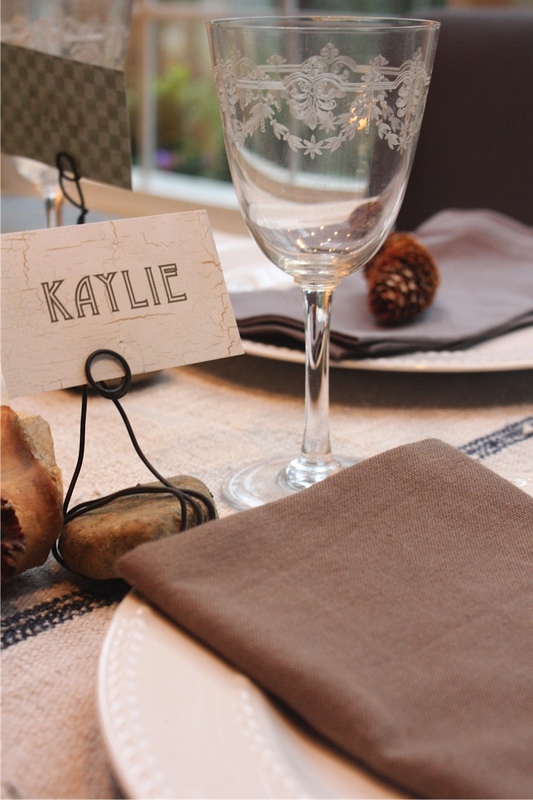 The table runner is from here. I used a mix of vintage silverware. I even added a little rusty trout! He looks like he is swimming up the table. 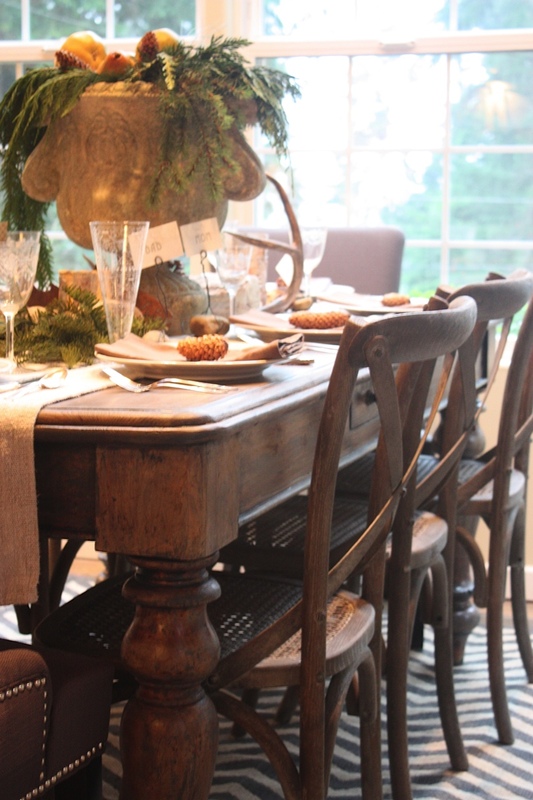 Now I just need to fill the table with family and friends for a big holiday feast! 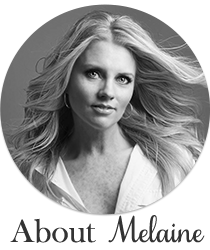 Wow, Melaine...your table is stunning! I just love all the natural rustic elements, but it is still very elegant too. Gorgeous! Very nice! It fits your home perfectly. 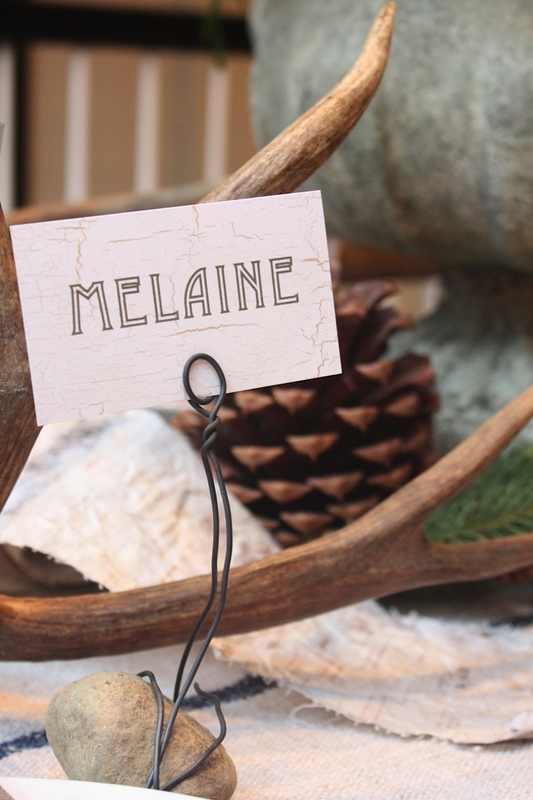 Your rustic table scape is fabulous, Melaine! 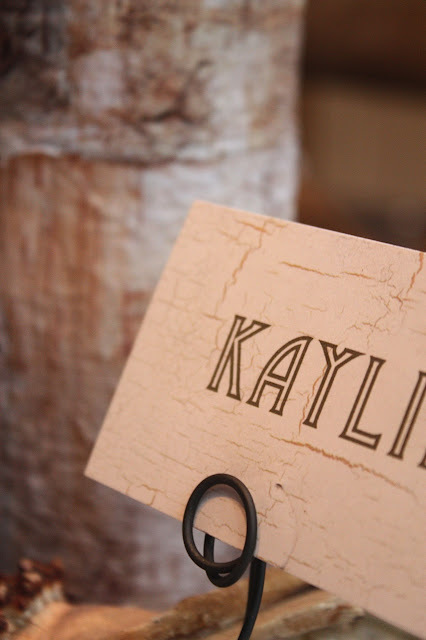 I love the birch sheets...great idea. The centerpiece is amazing. Happy Holidays to all of you! 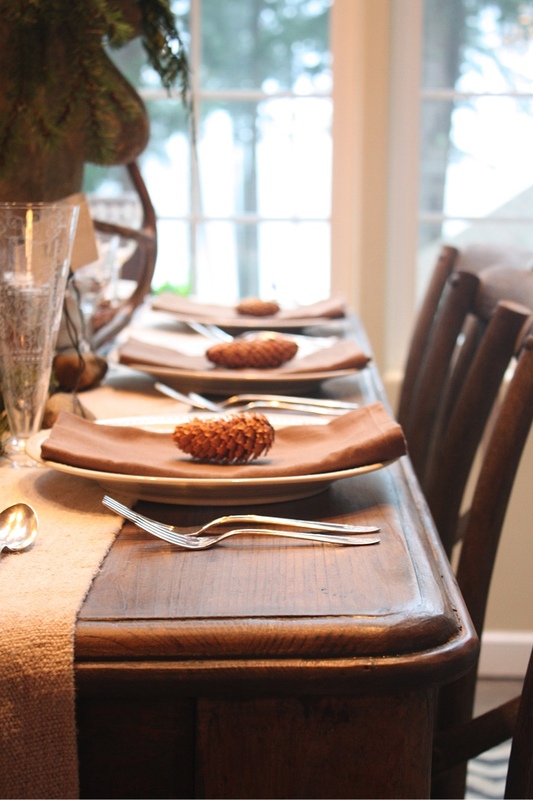 Love, love, love your table scape! I'm in the pacific NW too and applaud your use of our beautiful surroundings :). Happy holidays!! Beautiful table. You can always get pinecones, etc. and put them in a plastic bag in the freezer to get rid of unwanted little critters. Wow! 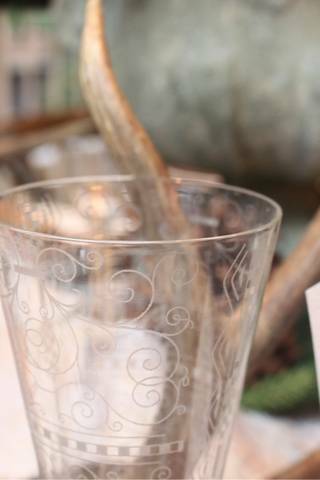 Gorgeous- love the candle idea!! the birch bark around the battery candles is genius! Melanie......you are incredible...that table is full of goodness. Those rock place holders are fab...and wrapping the candles was brilliant!!! 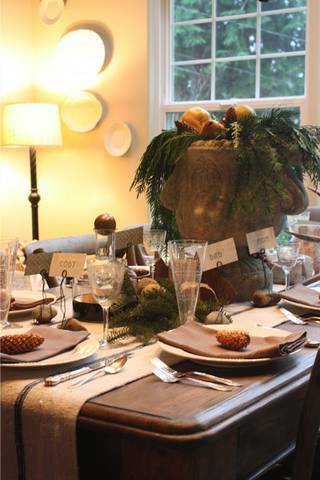 Melaine, your table is beautiful and I especially like the urn on the table. I do have one question, does your lantern light fixture have a solid bottom? I saw one in a Ballard catalog with a solid bottom and it was not reviewed well. Please let me know about yours and how you feel about it. Love this so much. It should be in a magazine. Lovely work, lovely ideas and beautiful post. My heart has always been tied to rustic, no matter how far I roam. Your table decor is absolutely gorgeous. Absolutely should be showcased. 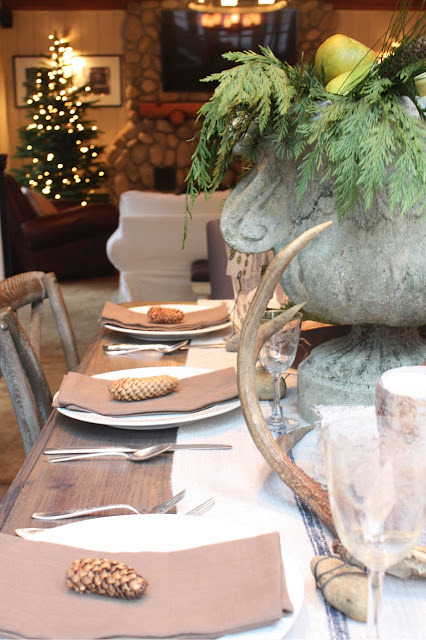 I've decorated a lot myself this year with rustic-themed touches, compliments of my mother-in-law's mountainous farm middle northeastern. 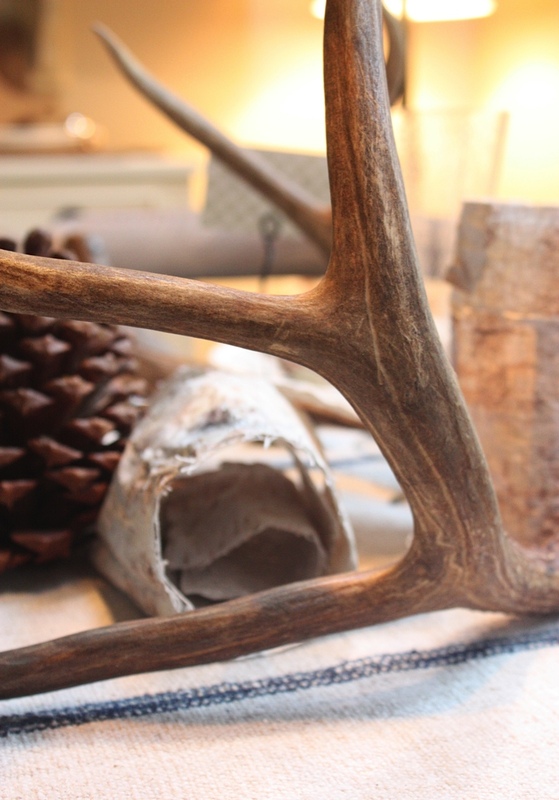 Need to come up with an idea for our two European deer head mounts. Très jolie table où le bois est à l'honneur ! Such wonderful use of nature - love it! Gorgeous table setting. I love the natural, rustic look -- especially the antlers! I wanna visit PNW so bad! I had no idea you were in the Pacific Northwest!!! Where at?